I came across this recently via the Sydney Bicycle Messenger Association’s site. The image above is a link to video on blip.tv that was posted by someone from the Calgary BMA. It’s good to see that something is going on in Calgary in the courier “community”. There are also some pix on that site which were taken by Rachelle, the first courier that I ever spoke to in Calgary. She was taking a break outside the convenience store on the corner of 9th Avenue and 9th St SW, at the base of the building that I was living in. I needed to earn some cash, so I quizzed her about the courier companies in town. A week later, I was no longer Ed, I was #34, Elite Fleet’s latest rookie AKA “hump”. Later on, it turned out that she was friends with my new found friend, Jonny “The Reverend” Love. He’s in one of Rachelle’s photos and so are also several other familiar faces from the time I was there. As for the video…it’s certainly…um, creative. A courier zombie movie, has that ever been done before? Before I created this post claiming to coin the term exenger (to refer to ex-cycle messengers) last May, I checked Google for any prior mentions of the “word”. Apart from some results such as some German, Star Trek fan-fiction about the USS Exenger, misspellings of the word “exchanger” and expired domain name pages for exenger.com…there didn’t seem to be any results that related to cycle messengers/couriers. I’m not claiming that I am the first dude to ever think of this portmanteau…but I think I was the first to put it online. Anyhow, I decided to do a the same search again and lo and behold, now the first four results are courier related. How about that? 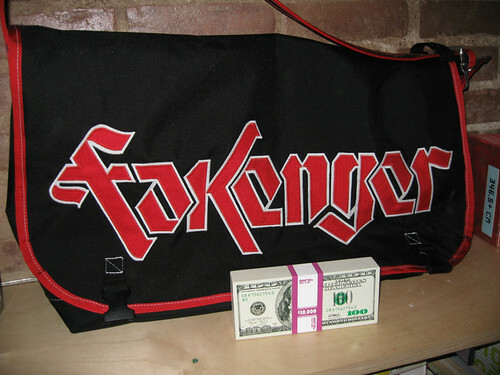 The first 2 results are from the London Fixed-gear and Single-speed site…some say the definitive fakenger website or at least right up there with the London Bicycle Fakenger Association. Results 3 and 4 are from Bill Chidley’s Moving Target zine…a favourite blog that I recommend. In fact, Bill has used the term exenger twice since my post according to the Moving Target blog search for “exenger”. Furthermore executing a Moving Target forum search for “exenger”, yields another 4 mentions. Googling for ‘exenger AND courier’ or ‘exenger AND messenger’ yields results on rollapaluza.com the London roller race organizers, fyxomatosis.com (my fellow high school alumnus, Andy White’s site) and most authoratively the Messenger Mailing List archive of the International Federation of Bicycle Messenger Assosciations (the organisation responsible for the Cycle Messenger World Championships in which I competed in 2004). To the best of my knowledge, all results have been since my exenger post on 3 May 2007. Perhaps I should buy the exenger.com domain? Erm, maybe not. Enough time wasted on this post…I’m off to cycle Mt Mattress. Lines from “Podium Finish”, from one of my old favourites from Melbourne, The Fauves. I recommended clicking the play button on the player that I’ve embedded below to use as a soundtrack for this post. This and other b-sides are freely downloadable from their website. Anyhow, this post is to inform you that I’ve added to my cycling palmarès in the past couple of weeks. For those of you that don’t know, a palmarès is the French term used in cycling that translates as “prize list”…so a list of wins, places and other notable results that you’ve had in past races. I’m not that much of a cycle racer. Despite liking cycling a lot, I don’t have the dedication to train enough to race seriously. However, once in a while I enter a (semi) competitive event and have had a couple of modest successes. This is how my palmarès (I use that term in the loosest possible sense) looked as of 2 weeks ago. 1st Montmorency Hillclimb. Montmorency, Victoria, Australia. Not as impressive as it sounds. This was a short sprint held on the slightly uphill main drag of this outer suburb of Melbourne as part of a community festival. 23rd 4 July. Cycle Messenger World Championships. Edmonton, Alberta, Canada. I was pleased at this result in the CMWC, held just up the road from my old stomping ground in Calgary. I know I always bang on about this but I think that cycling 8hrs+ in constant rain (about 10° C) to qualify and then 5 hours in intermittent rain during the final is an achievement. I even finished ahead of Kevin “Squid” Bolger. It was an improvement on not qualifying for the final of the European Cycle Messenger Championships in London the previous year. At the very least, it’s a good war story to tell at the pub! 5th 27 May. Gran Fondo Cymru (Sporting Route). Bala, Gwynedd, Wales. This event was held in Snowdonia National Park in Wales and last year, Gerard and I participated in the inaugural edition of this cyclosportive as detailed in the posts “A Hill too Far” and “To Ride or to Puke”. In 2006, we did the 180 km/110 mile Gran Fondo route, but this year a variety of factors (not least laziness) meant that we were both under-trained for that distance…not to mention the Welsh hills! Therefore, we decided that the 60 km/40 mile route was the go, seeing as we’d already shelled out £25 to enter and also paid for accommodation. Although this felt like a bit of a cop out for a while, the nearer the date of the event, the more it seemed like this decision didn’t seem such a bad thing when we saw the weather forecasts. The whole weekend was forecast to be one huge downpour with max. temperatures fluctuating between 1° C and 10° C, depending on when the Bala metcheck.com page was reloaded. 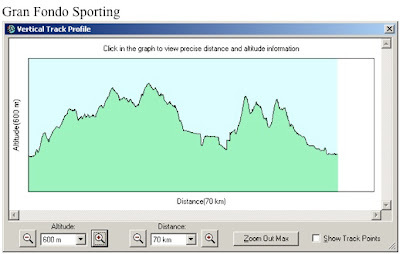 The profile you see above is downloaded from Gerard’s GPS unit and you can see that even though the distance was only 60-70 odd kilometres, there were still some hills to be reckoned with. 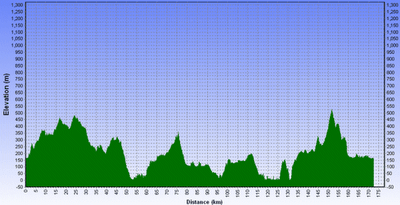 The first half of the route was into a stiff wind…at its worst maybe 30mph. Also, the spikes in the second half of the ride were pretty draining, exacerbated by the incessant precipitation and the cold conditions…probably about 3° C before windchill on average. I recovered quickly enough to have a strong run in the last 10km back into Bala to clock a time of 2hr 42min 54sec, placing me just off the “podium” in 5th. The caveat here is that all the super strong cyclists were all busting their butts on the 110mile Gran Fondo route and the 125 mile Super Challenge but not bad nevertheless. 5th out of 68 finishers, according to the official results sheet (85-ish starters). Doing a 3 hour ride instead of an 8+ hour one had other advantages apart from spending less time in the freezing Welsh weather. It also meant that I wasn’t completely knackered like I was in 2006 and was able to enjoy my afternoon and evening more this year. The trip back to Oxford via Port Meirion was also quite pleasant…the sun came out! However, I promise to train earlier and more frequently for next year’s GFC!! Stay tuned for my account of extending my palmarès further by getting on the “podium” of last Friday’s Oxford Bingo Alleycat! My recent post about the recent Oxford HGV death that” linked to Moving Target “the world’s most useless messenger zine” gained me a link in its sidebar (thanks Bill), making my pageviews spike upwards dramatically. This made me pretty happy as Moving Target is a site that I regularly read. Now my post has fallen off the end of Moving Target’s homepage linkroll and my millions of page views are now back down to the usual tens of thousands only. So, I thought I’d attempt some blatant traffic driving and discuss the rising popularity of the fixed gear bicycle and the concept of the fakenger/posenger/ex-enger…inspired by the fact that the fakenger article on MT is its most popular apparently, so I thought I’d sell out. I can’t wait to see my Google Analytics stats go psycho!…or not. Here is the Urban Dictionary’s definition of fakenger and posenger. I admit it, I am a posenger (exenger). I once worked as a courier and it was one of the best times of my life. However, I haven’t delivered a package since 2001 but I’m dressing more like a “courier” now than I did when I was actually picking and dropping. Also, in 2003 almost two years after hanging up my pager, I obtained a fixed wheel/gear bike which is in direct contrast to the courier ghetto bike that I used when I was on the job. I thought I’d attempt to coin my own term for it though, exenger… ex-Messenger…to try and differentiate myself from the hipster masses. Whaddaya reckon? Associated with the fakenger/posenger meme is the rise of the fixed gear (or fixed wheel) bicycle AKA fixie. I’ve noticed quite a lot of internet talk about the fixed gear bike trend/craze/fad. I’ve also noticed that there are definitely quite a few more fixed gear riders on the streets of Oxford than in previous years, which I guess isn’t surprising given the coverage in publications such as Cycling Plus and also the influx of students from the USA now that term has started and the weather has improved. I did a search on Technorati the other day and discovered that there was a big spread in the New York times last Sunday about fixed gear/wheel bicycles. Does this mean, as Iconic’s blog suggests that riding a bike with a fixed wheel has jumped the shark? Couriers and the accoutrements of the profession have long percolated into popular culture viz. Crumpler (and other brand) courier bags becoming ubiquitous, Kevin Bacon’s Quicksilver movie and numerous articles about “urban assault riders” with “kamikaze, counter-culture” lifestyles being examples. My take (probably not surprisingly) on it is that I think it’s fine to mimic the courier thing…one less car and all that. However, in a bid to big myself up…with only a little digging it’s possible to discern the exengers (like me) from the fakengers who have never been a working courier. In your face fakengers…vive l’exengeur!! I might have more to say on the matter later but that’s all for now. Time to ski Mt Mattress. If you’ve delved into the eclecticism of this blog at any point, you’ll know that I quite like cycling. My first bicycle was a little, yellow Star Flyer that I had in New Zealand. It had stabilizers/training wheels for a while. The coolest thing about it was the AM radio on the bars and the grip that made a motorbike noise when you twisted it. I won a little, local race called the Montmorency Hill Climb in the year 2000 in Australia. This isn’t quite as impressive as it might sound but it’s still an achievement. 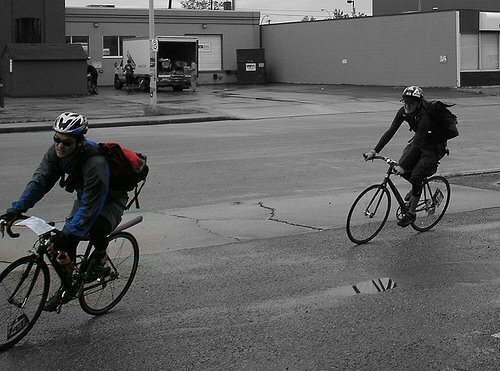 I was a cycle messenger/courier in Calgary for a spell in 2001. It was only for 9 months, so I’m still technically still a rookie. My courier number was 134. 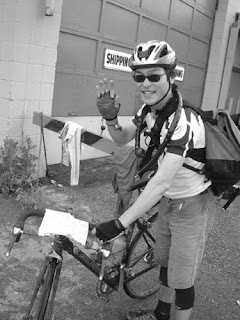 Being a cycle courier was an awesome job which changed my life…I thought I was into cycling before 2001 but it was nothing compared to after couriering in Calgary. I thought about working in London when I arrived in the UK but decided against it. I competed in the European Cycle Messenger Championships in London in 2003. 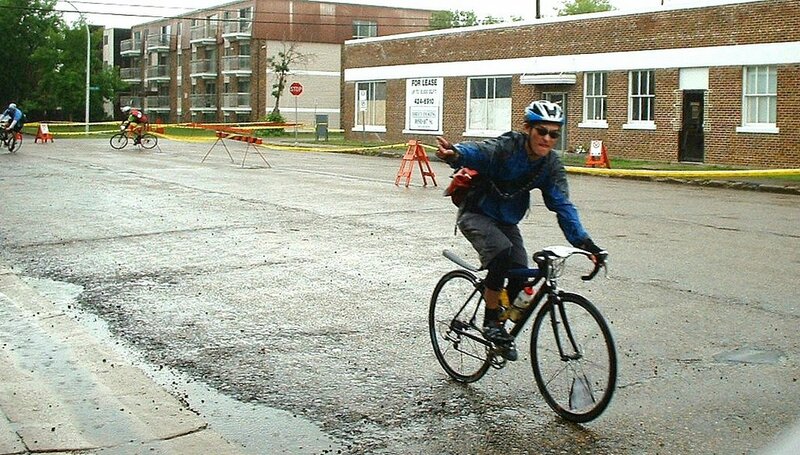 I was 23rd in the 2004 Cycle Messenger World Championships in Edmonton. I have three bikes at the moment. They all have names. One of the tenets of my life that I try to abide by is, “An International Man of Bike shall never be anchored by the mundane”. It’s debatable as to whether blogging about it automatically nullifies that statement or not. In point 3 I mentioned that I am technically still a rookie. Here’s a video of someone who is definitely a “vet”. Kevin Bolger, New York City’s most famous messenger….